At one point early in his career, Detroit Lions quarterback Matthew Stafford was dubbed a "China Doll" by (then) teammate Zack Follett. In his first two seasons, the former No. 1 overall draft pick had missed 19 games. Over the past seven seasons, Stafford has not missed a single game and has proven to be one of the most durable players in the league. As the saying goes, the most important ability is "availability." During that time, the Lions have struggled to run the ball. Not only did they rank last in the NFL in rushing (76.3 per game) last year, but they haven't had a 100-yard rusher since Reggie Bush (2013). In addition, only the Dolphins called a run on a fewer percentage of plays than the Lions in 2017. Granted, their first two 2018 draft picks including Auburn's Kerryon Johnson, the SEC Offensive Player of the Year, shows that the team and new head coach Matt Patricia should be more committed to the run. But the good news is that there won't be turnover in terms of offensive schemes as the team retained the services of offensive coordinator Jim Bob Cooter. Partly due to his availability, scheme and lack of a running game, Stafford has been highly productive over the past seven seasons. During that stretch, he has finished outside the top-12 fantasy quarterbacks only once (2014). Both Marvin Jones and Golden Tate reached the 1,000-yard mark in 2017. In fact, Jones set a career high with 1,101 yards and finished the season as fantasy's WR5. Meanwhile, second-year receiver Kenny Golladay is a potential breakout candidate that gives Stafford a talented trio of wide receivers. Based on the average fantasy points allowed of all opponents, only Patrick Mahomes (32nd) and Aaron Rodgers (31st) have a more difficult fantasy football strength of schedule than Stafford (30th) in 2018. And only Miami's Ryan Tannehill and Mahomes have a more challenging fantasy schedule over the fantasy playoffs (Weeks 14 to 16). 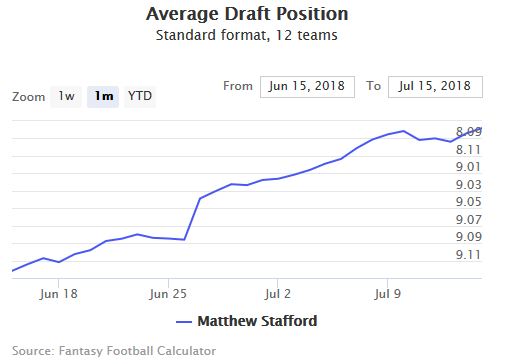 Stafford's fantasy football ADP has steadily moved upward — 10.04 in early June to 8.08 in mid-July — over the summer. A month ago, I viewed Stafford as being undervalued. Now that his ADP has crept up by nearly two rounds over the past month or so, Stafford's current ADP (QB10) is more in line with my rankings/projections (QB8). As I wait on QBs in most drafts, I'd be more than comfortable going into the 2018 season with Stafford as my every-week starter.